LONDON: British MPs yesterday began five days of debate ahead of a historic delayed vote on Prime Minister Theresa May’s Brexit deal, a day after giving her a stinging blow aimed at preventing the country from crashing out of the EU with no agreement. May’s attempts to win over MPs from Northern Ireland’s Democratic Unionist Party (DUP), which props up her government in parliament but is firmly opposed to the Brexit deal, were also rebuffed yesterday. The government said it would grant local lawmakers in Northern Ireland greater powers to block legislation if their province ever found itself in a contentious “backstop” arrangement to avoid a hard border in Ireland. But DUP Brexit spokesman Sammy Wilson told Sky News that the proposals were “window dressing” and that there would still have to be checks between Northern Ireland and mainland Britain in the event the backstop is enacted. May faced another possible setback later yesterday as rebel Conservative MPs pushed for a vote that would force the government to reveal its plans within three days if the Brexit deal is not approved next Tuesday. Lawmakers next week will be voting on the agreement that May has negotiated with the EU over the last 18 months, which faces daunting opposition as the clock ticks down before Britain leaves the European Union on March 29. The prime minister has warned rebels in her own party that defeat will lead to a no-deal Brexit, or no departure from the bloc at all. 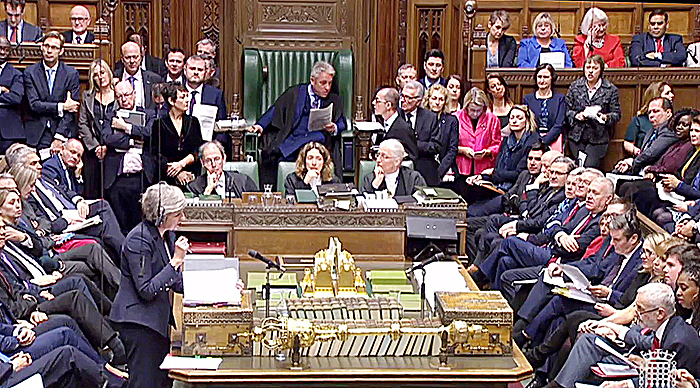 But in a vote on Tuesday that raised the chances of a defeat in next week’s historic vote, MPs including former ministers approved an amendment that will curtail the government’s tax powers in case of a no-deal Brexit. The prime minister has already pulled the vote once with defeat looming, and has said a loss for the government would plunge Britain into “uncharted territory”. She is still seeking assurances from the EU on the most controversial elements of the Brexit deal relating to Northern Ireland, in a bid to convince critics to back the agreement. These assurances are set to be delivered to lawmakers before they vote, although not before they start their debate yesterday. Some MPs would be in favor of a second referendum but such a move would likely cause outrage among Brexit voters and raise the issue of the framing of the question. The battle has reached fever pitch as the deadline looms, with second referendum campaigners setting up stalls at markets nationwide and Brexiteers touring the country to persuade Britons they have nothing to fear from a clean break.